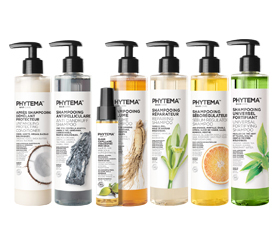 Phytema™ Laboratoires offers a range of natural and organic hair care products. 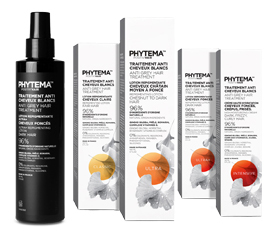 The products in the Hair Care™ range are made using natural active ingredients, most of which are produced organically, to take care of your hair naturally. There are several simple and inexpensive steps that you can for hassle-free hair care. Firstly, do not wash your hair every day. Sebum serves to protect the hair fibre, but intensive use of shampoo eliminates sebum, causing the body to compensate by producing excess quantities. Using the cool mode on your hair dryer is as simple as flicking a switch, and also helps to set your style in place. Using cold water to rinse your hair in the shower helps to increase shine, as it causes the scales on the shaft to close up. It is also important to use shampoos that do not contain sulphates, as these tend to damage hair that is already vulnerable. It is preferable to opt for shampoos with natural or organic active ingredients, as these are less aggressive on the scalp. Going to the hairdresser regularly to have the ends trimmed is also important, so as to prevent any splits continuing up the hair shaft.